High Quality Content by WIKIPEDIA articles! The Fourth Amendment to the United States Constitution is the part of the Bill of Rights which guards against unreasonable searches and seizures. It was ratified as a response to the abuse of the writ of assistance, which is a type of general search warrant, in the American Revolution. The amendment specifically requires search and arrest warrants be judicially sanctioned and supported by probable cause. Search and arrest should be limited in scope according to specific information supplied to the issuing court, usually by a law enforcement officer, who has sworn by it. 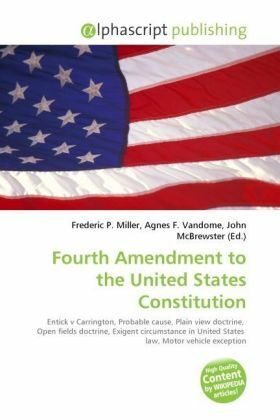 In Mapp v. Ohio, 367 U.S. 643 (1961), the Supreme Court ruled that the Fourth Amendment applies to the states by way of the Due Process Clause of the Fourteenth Amendment. The Supreme Court has also ruled that certain searches and seizures violated the Fourth Amendment even when a warrant was properly granted.